After four years of inattention, it was certainly time to refresh the Raspberry Pi boards located in my residence. The older Pi, shown below, was at least 5 generations behind in hardware with hand-wired sensors located on a prototyping HAT (Hardware Attached on Top). The setup looked old and cobbled together. The larger SD card - left over from the first generation Pi - sticks out, along with a WiFi adapter. This is the story of AstroPi and the Raspberry Sense HAT. The AstroPi Project was a teaching device and STEM emersion course which allowed EU students the amazing opportunity to conduct scientific investigations in space, by writing programs that run on the AstroPi aboard the International Space Station. Hundreds of students wrote programs that ran in space, and thousands of students learned about Pi and Python programming. The Astro Pi HAT has now been accepted as a popular RasPi extension, now known as the Raspberry Sense HAT. I decided to learn to program the Sense HAT, and upgrade my first generation Pi to the latest model. Through Amazon Prime, these parts were received the next day and quickly assembled. Voila! No WiFi adapter is needed as it’s built in to the Pi. The Sense Hat comes with stand-offs and a custom case, which packages neatly the entire assembly. One can build all types of interesting applications with these sensors, including hand-held games, weather instruments, science experiments, novel displays, etc. Now we are ready to install the software. First, we have to build the micro-SD card. The best way to do so is to download the image of the latest Raspbian OS. Next, on my MacBook, we insert an 8GB or 16GB micro-SD card in carrier and run ApplePi-Baker. Select the SD-card - it comes up as /dev/disk2 on my MacBook. Select the IMG file: First, again, we go to the Raspbian download site and select the latest. Notice I’ve selected 2018-06-27-raspbian-stretch.img, which was in my downloads directory. Next, click Restore Backup. I noticed that this took 3 minutes on my most recently purchased SD cards, 6 minutes on a few older cards, and 12 minutes on an even older card. It can be concluded that the underlying SD card technology has evolved and improved over the past couple of years. It is time to retire those older/slower SD cards. The Restore Backup command provides a good metric for figuring out which SD cards are poorer performers. This ensures that the ssh daemon runs, (see additional documentation). Therefore, we will be able to ssh into the RasPi. Except, of course, mySSID and myPassword are replaced with my actual WiFi login credentials. From the Terminal Window, place a copy of wpa_supplicant.conf in the root directory of the boot volume with the cp command. As a result of this change, a reasonably sized, 1024 x 768 display is seen, when we VNC into the Raspberry Pi. Next, we eject the SD card volume, remove it from the MacBook and place the micro-SD card into the Raspberry Pi. We apply power and watch it boot. In no more than two minutes, it is up on the network. But what’s the IP address? To determine the IP address – so we can connect to it – we use a Network Scanner. The hostname is raspberrypi, and we see its IP address is 192.168.2.138. Perfect. The next step is to run raspi-conf. Under Network Options, change the Hostname … to personalize or differentiate from all of your RasPi boards. Normally, the Raspberry Pi reboots at this point. Wait for it to reboot, and then connect to it again via ssh. The first thing I always load on my Raspberry Pi is RealVNC. This enables me to connect using VNC, from the local network, or using RealVNC for outside the local network. Since we earlier enabled VNC (from raspi-conf), we will be able to connect to our Raspberry Pi using VNC. However, first we reboot. After a minute of reboot time, we can connect using VNC. There are several VNC client alternatives to create a connection. One alternative is to use the RealVNC application on the MacBook or RealVNC iOS app for iPad. I like to use the VNC Viewer for Google Chrome to connect. After installing, run it from the Apps pulldown (top left side of the Chrome bookmarks bar). It pops up a new window, as seen below. It is advisable to run the Welcome To Raspberry Pi dialog. This is the easiest way to set the locale and timezone options. You are now asked to change the password (again). The welcome-to script is not aware that we previously did that in raspi-conf. Click Next. Then, skip the WiFi network step, because we obviously are connected on the WiFi network. Do the Updates step, even though this seems to overlap with what we did in the previous ssh shell; there is no harm in doing it again. However, it takes 20 minutes to update, so this Updates step is clearly doing more. Finally, the Raspberry Pi reboots yet again. There are a number of additional steps you could do at this point. For example, you can set up the RealVNC server on the Raspberry Pi to login to your RealVNC account, and therefore allow connections from outside your network. However, the main thing I want to do now is play with my Sense Hat. So let’s get into that. Now, we are ready to build our Sense-HAT application. Using the Raspberry Sensor HAT turns out to be very, very straight forward. What should my application do? 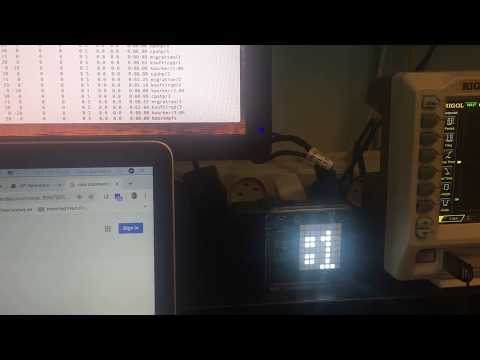 My first idea is to simply display the Time and Temperature every minute. To do so, we put the following code in a file called every_minute.py in the home directory of pi. message = now.strftime("%H:%M") + ", " + str(tempC) + " C"
so this command runs once a minute. That's all it takes. Now every_minute.py runs once-a-minute. Somewhat satisfying to watch. 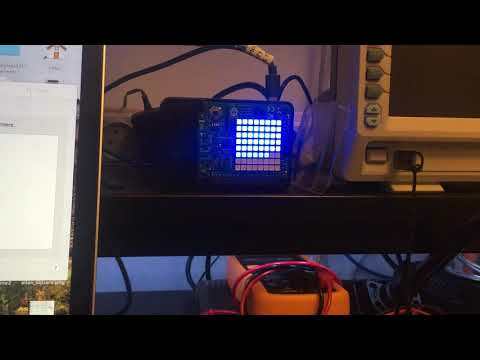 I made a video showing this simplistic display. Also, my application will utilize more sensors, and display the Temperature, Pressure, Relative Humidity every minute. Sorry, it is difficult for my cell-phone camera to capture the true colors or true brilliance of the display. You will just have to build this project, in order to see for yourself. For the reader’s reference, a fantastic tutorial on using the Sense Hat is at this URL. What is my conclusion? Programming the Raspberry Pi is fun. Python is great. The Sense Hat is a set of environmental sensors and display elements that we can use to make all kinds of fun toys or devices. I think the process of introducing both the Raspberry Pi and Python and Space to students was laudable and successful.